I won’t be able to watch Mobile Suit Gundam NT until mid-January but this kit reveal basically cements the film as a definite sequel to Mobile Suit Gundam UC. The Narrative Gundam is a Psycho-Frame test mobile suit used during the Phoenix Hunt Operation in its incomplete state, hence the exposed inner frame. Prior to the film’s release, the A and B-Packs have been already revealed, with the latter kit being an online exclusive expansion set. Not really sure how I feel about the design but regardless, this is the final form of the Narrative Gundam in the movie and it’s essentially another Unicorn Gundam in Destroy Mode. The C-Packs also adds a beam rifle and a shield with Psycho-Frames to its arsenal. You also have the option of using an alternate set of red optic seals for when it activates the NT-D System. Finally, first production runs of the kit would include a special booklet about Gundam NT. Not really sure if this will come with all the parts to build the Narrative Gundam in its vanilla configuration, but this is a viable option for those who didn’t want to purchase the first release which included the A-Packs. 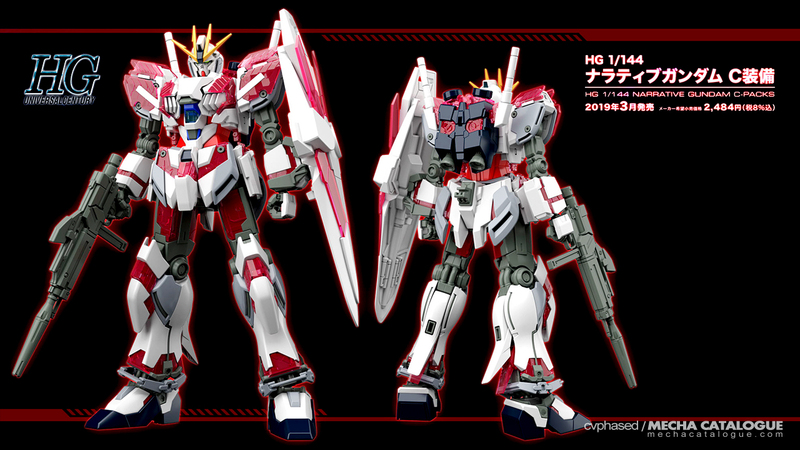 Images via Bandai Hobby Site.